Dependent origination (Skt. pratītyasamutpāda; Tib. རྟེན་འབྲེལ་, tendrel, Wyl. rten 'brel) means that all phenomena, outer and inner, do not appear without any causes. Nor are they caused by a causeless and permanent creator such as the self, time or God. In fact, they arise through the coming together of their own particular causes and conditions. All outer phenomena (ཕྱིའི་ཆོས་, Wyl. phyi'i chos) arise through dependent origination, in the manner of a seed developing into a sprout, for example. And all inner phenomena (ནང་གི་ཆོས་, Wyl. nang gi chos)—the aggregates of supreme, intermediate or lesser beings—arise through dependent origination in the manner of the twelve links. These six act as cooperating conditions and assist in the growth from seed to flower. Ignorance, craving and grasping—the three links that are disturbing emotions—arise with the co-operating conditions of the six faculties and their respective objects. The same conditions assist in the arising of the two links of karma—formations and becoming. The sprout, for example, arises after the seed has ceased and not while the seed is present unceasingly. Phenomena, therefore, are not permanent. The sprout does not arise from discontinuance, the seed having ceased completely. The cessation of the seed and the growth of the sprout occur simultaneously like the two sides of a set of scales, or a see-saw: one goes up as the other goes down. Since there is not interruption of the continuum, there is no discontinuance. The seed and the sprout are not one in terms of their identity or their function, so the former is not transferred into the latter. Tiny seeds can grow into enormous trees, so therefore small causes can produce large effects. Wheat seeds produce wheat crops and virtue produces happiness, so there is a correlation between cause and effect: they are of a similar continuum. (i) The past cause of ignorance and karmic formations lead to the result of (ii) one’s consciousness of the present life and the links up until becoming, through which one accumulates the karma through the negative emotions of craving and attachment, that will lead to (iii) a future rebirth. One takes birth according to one’s karma and experiences the sufferings of old age and death and so one. (i) The ignorance of one’s previous incarnation, and the karma created through the power of craving and attachment, cause (ii) one to take another birth, and in that present life there arise the links from consciousness through to becoming and old age and death. Ignorance is the ignorance through which one engages in the act. The action itself is the karmic formation. Then there is the consciousness of that particular time. Produce the contact with the weapon. One’s own pleasure and the pain of the other are sensations. Joyfully engaging in that is craving. From this comes grasping, which is enthusiasm for similar acts in future. The aggregates at the time of the act are becoming. Their present and future aspects are birth. Their changing is “aging” and conclusion is “death”. The three links of ignorance, formation and consciousness are the propelling links. The four from name-and-form to sensation are the propelled result. The three links of craving, grasping and becoming are the fully establishing links. Birth and old age and death are the fully established links. The links of formations and becoming are karma. The links of ignorance, craving and attachment are disturbing emotions. The remaining seven links are the bases of suffering. From the three links of disturbing emotions, the two links of karma arise. And from them, the seven bases of suffering arise. From these seven, further disturbing emotions and karma are created forming a continuous cycle. Consciousness is like a seed. Karma is like a field. Craving is like moisture. Ignorance is like the act of planting and the fertilizer. Through these four the fresh shoots of name-and-form develop in the various states of existence. 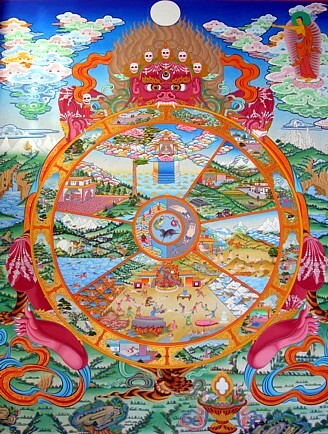 In progressive order, the two links of karma and three of disturbing emotions are included under the truth of origin. And the seven bases of suffering fall under the truth of suffering. In reverse order, the reversal of the links of karma and disturbing emotions is the truth of the path. And the ceasing of the seven bases of suffering is the truth of cessation. This page was last edited on 13 January 2019, at 10:07.